and may we have many more. 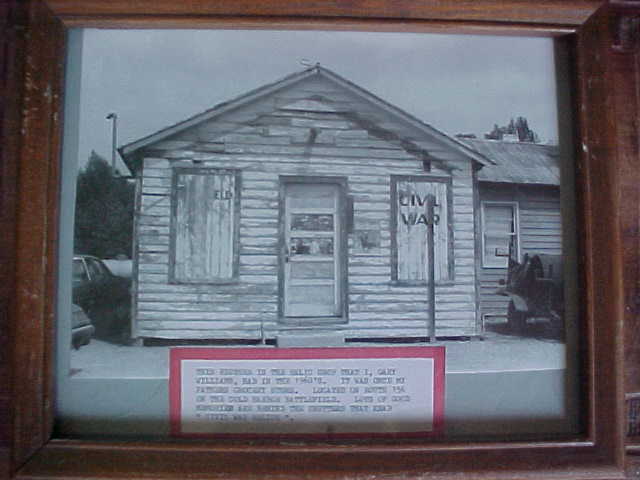 Civil War Relic Hunting through the Years . 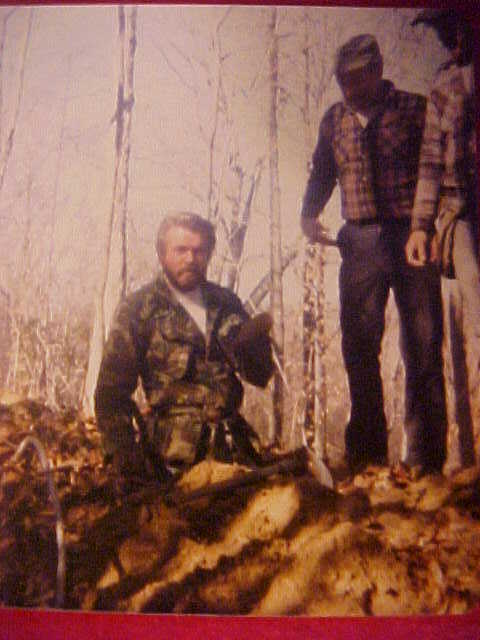 I began hunting in 1955 and began reproducting the original buckles I dug in 1967. Left to Right - DIV Relic Hunt Gary Williams (GW); James Lyles talking to me about the day's relic hunt ( 1862 Seven Days Battle and 1864 Cold Harbor Battle six mile trench lines ran through his woods. 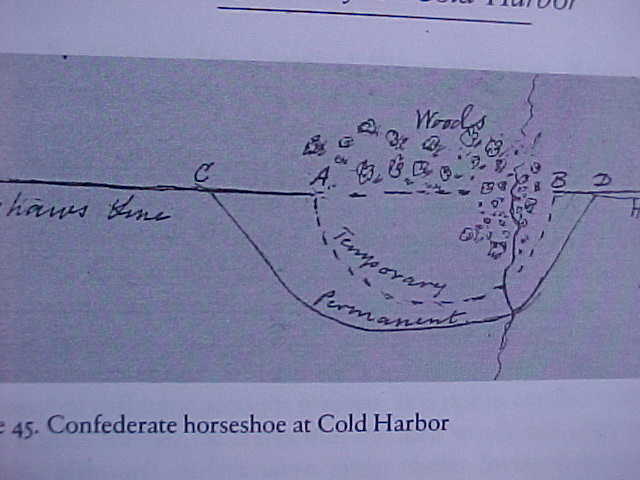 I dug many of the relics displayed in my Cold Harbor museum from these trench lines). Pictured next is the Adams Farm. Mr. Adams' land joined Mr. Lyles. I am digging in the field where the Confederate trench line was before it was filled in by the Adams for additional crop field. 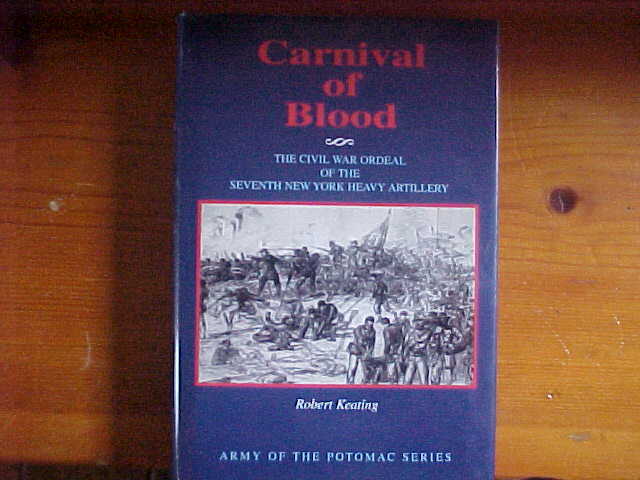 The 7th New York made a bloody charge up the hill and for a short time over ran the Confederate trench. They did not keep this ground very long and along this six mile front 7000 Union soldiers fell in thirty minutes. 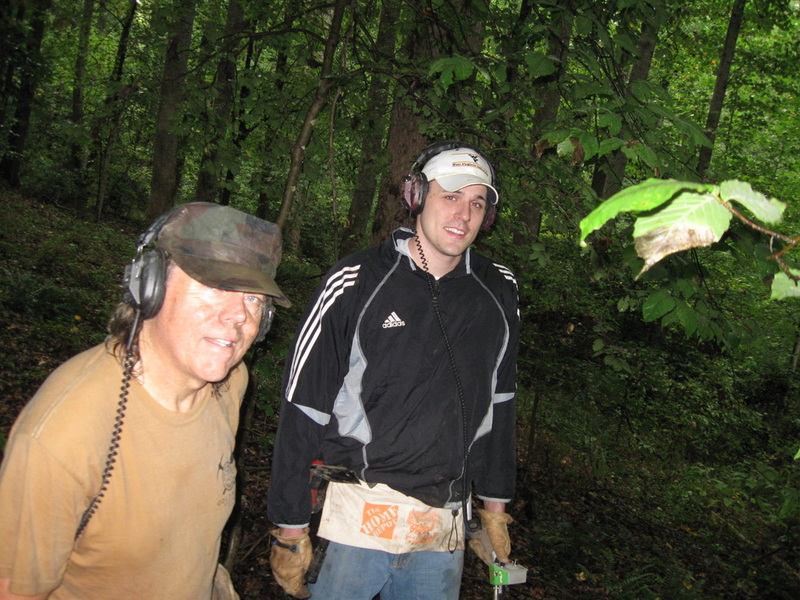 Next picture: GW and Steve Sylvia of "North South Trader" magazine at a DIV relic hunt. 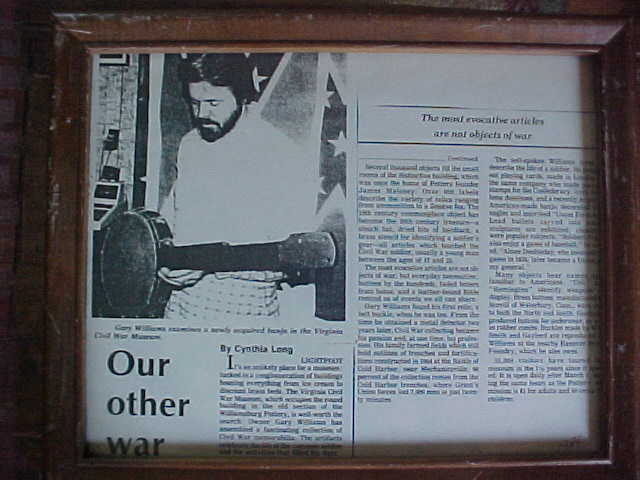 Steve is the original when it comes to civil war magazines. buckle foundry business at this location in 1967. 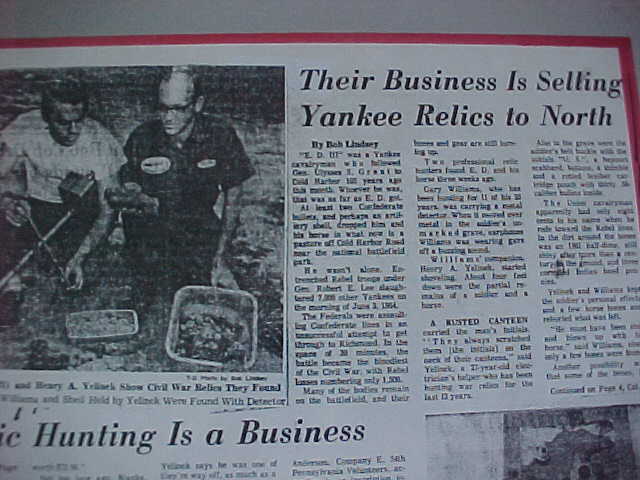 The Mechanicsville Local wrote an article in 1981 about my collection and relic room in my home. 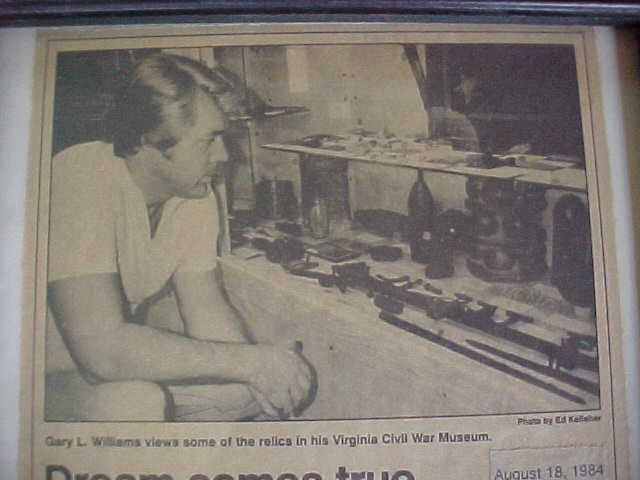 Not long after this I opened the Cold Harbor Civil War Museum in Williamsburg, VA.
five feet tall and relics are deep. 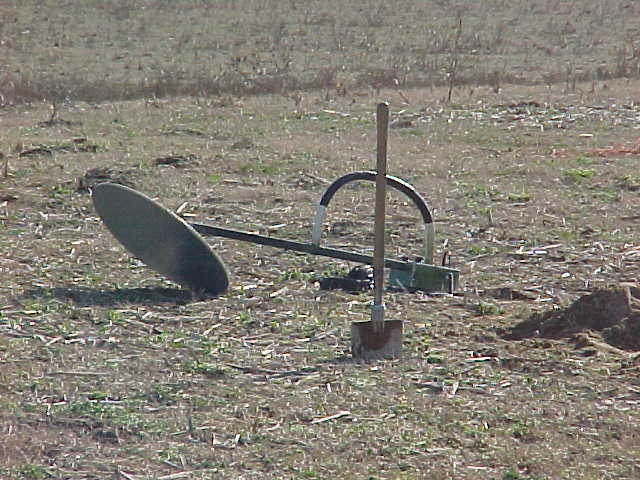 I was the first to get the so called "deep seeker" and it was exactly the machine that you could dig belt plates waist deep in the Cold Harbor sandy soil. Herby Parham and John Robinson made me several different types but always with the large search loop. I have used this Double Eagle since the 1960's and in the photo below you can see the results of a day's hunt with eight belt plates, canteen, bayonets and also bullets and buttons. 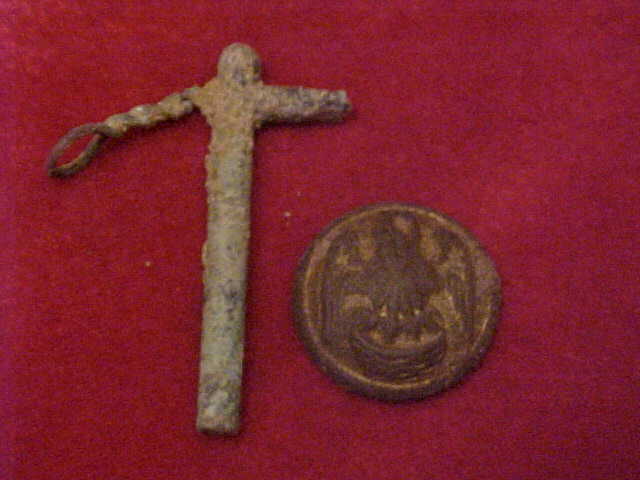 Even though it had the large search coil you could find small items that were also deep. 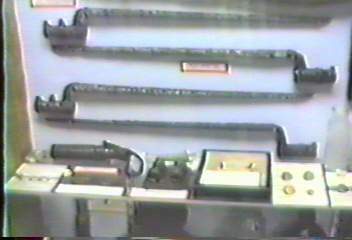 The last Double Eagle that was custom made for me is pictured on the right with a 22 inch search coil. It is the machine I still use today. The Fisher T-10 that I first used in 1955 looked like a toy beside the Double Eagle. Another great machine in 1960 was the MetroTech. Detector made just for my type relic hunting. Would find a cuff button deep or artillery shell. All you had to do was learn to use it and it would reward you with many relics. "Double Eagle". "John Robinson" is the man that made the Double Eagle pictured on the left. John made me many Double Eagles with the twenty plus inch search coil. We would relic hunt the battlefields at Cold Harbor,VA and I would trade the relics for the Double Eagle. 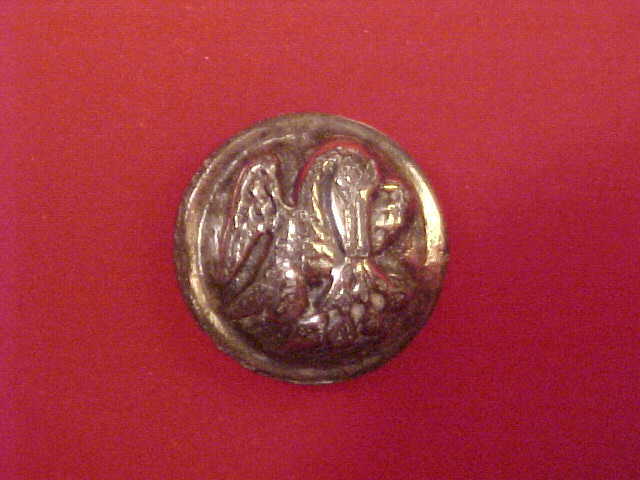 Herby Parham later became his business partner and I also used his Double Eagle. 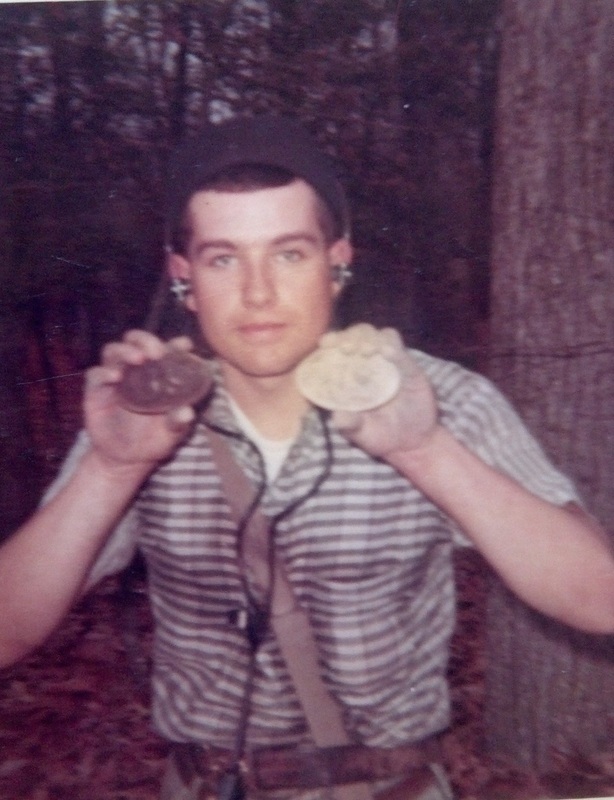 John loved to dig the civil war artillery shells. The custom Double Eagle "Deep Seeker". 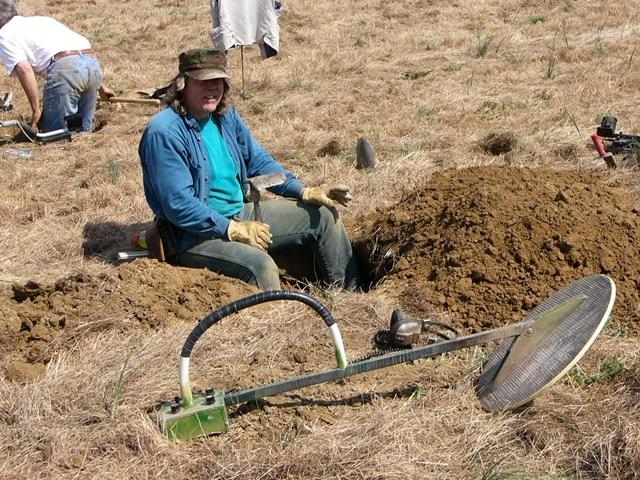 I am setting on the top of a trench with my feet in the hole with a artillery shell that I dug waist deep. Only machine I ever used. June 12, 1969 - May 31, 1972. 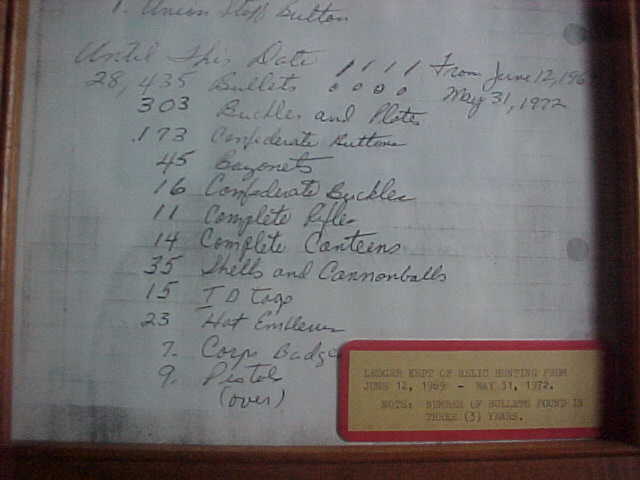 Note the number of bullets dug in three years: 28,435. 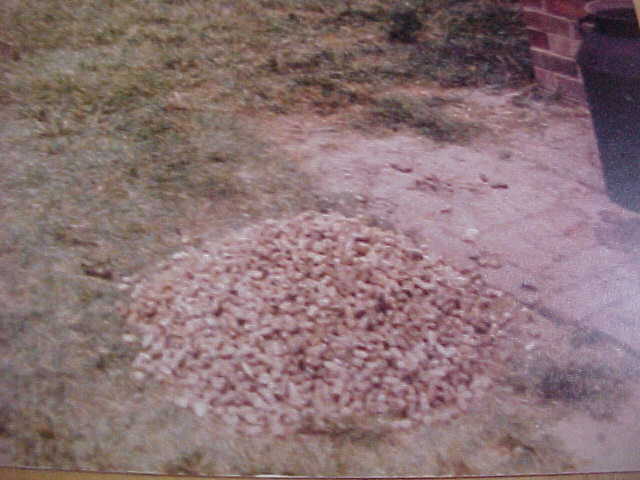 This was back when I dug just about every day. Mike O'Donnell, author of many civil war books and relic hunter, now has my ledgers. 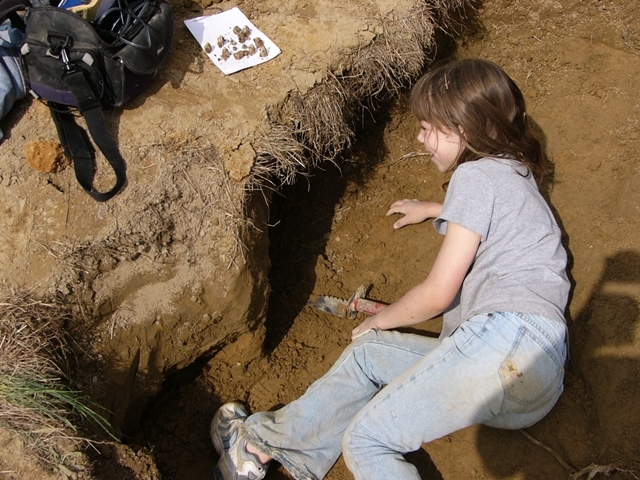 Pictured to the left is my daughter, Presley, digging in a hut site at a DIV dig. 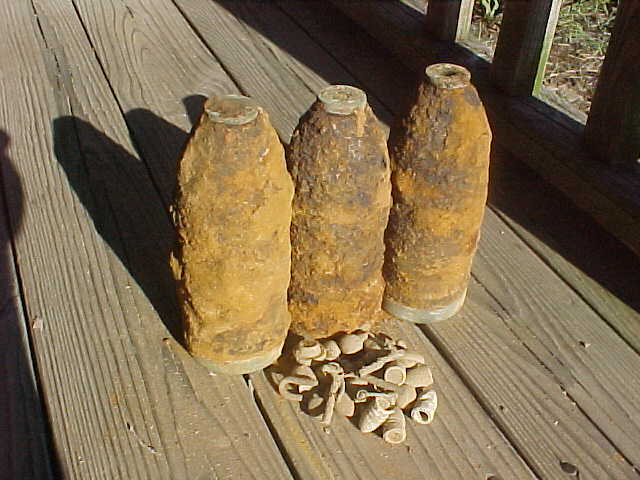 The three Read shells, cannon primers, Louisiana button and bullets came from the Confederate horseshoe trench. 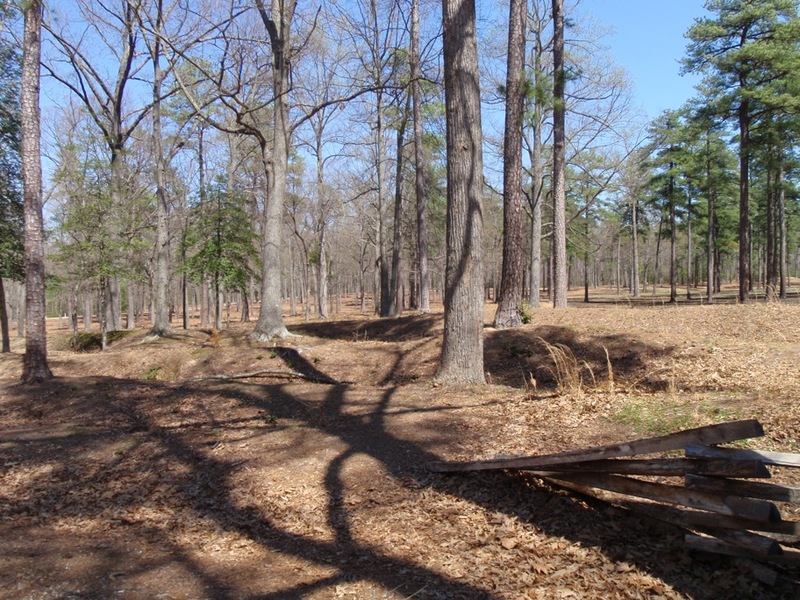 Relics are still coming from the confederate horseshoe trench at Cold Harbor. 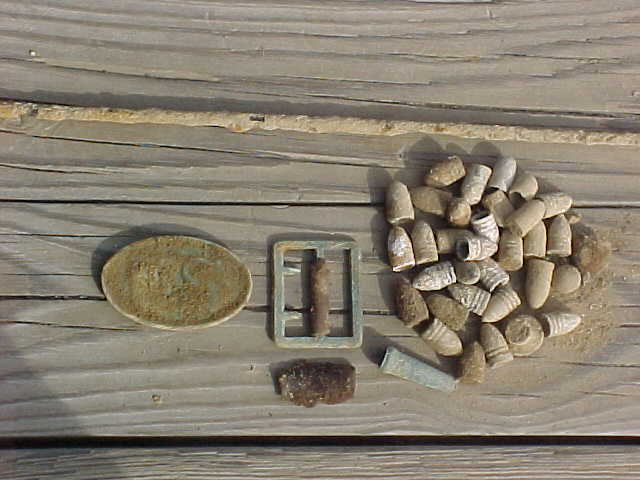 Confederate frame buckle, U S buckle, U S box plate, ram-rod, two bayonets, remains of a enfield bayonet scabbard, remains of leather cartridge box, burnside cartridge, and many bullets. 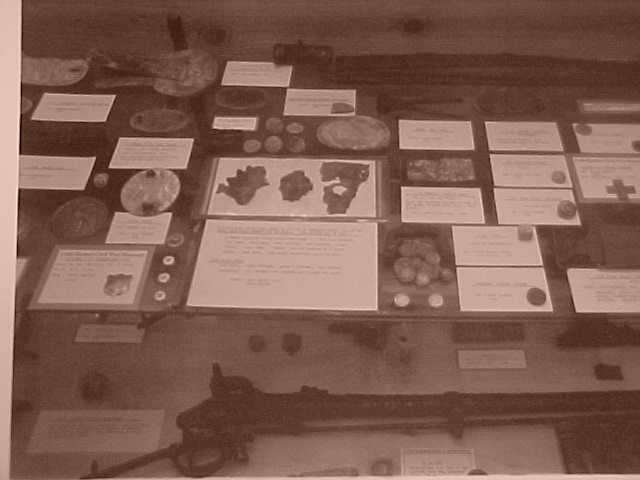 All this is from the confederate trench and very deep. 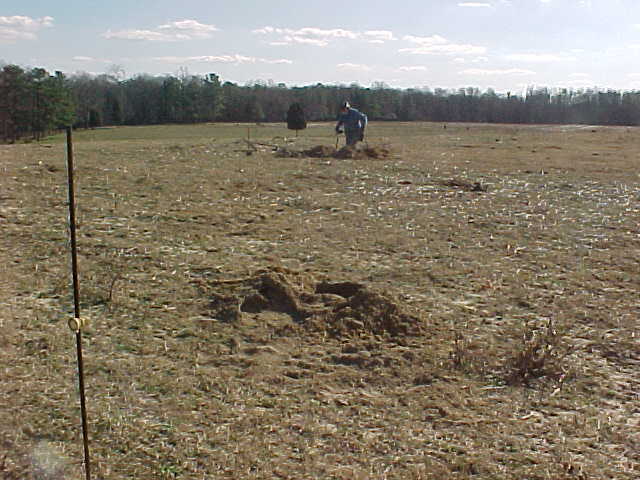 A very good two day hunt in Feb. 2009.
drawing of the horseshoe trench. On June 3, 1864 (2ndCold Harbor) Grant sent his Army across open fields to attack the well-fortified Confederate trench line. 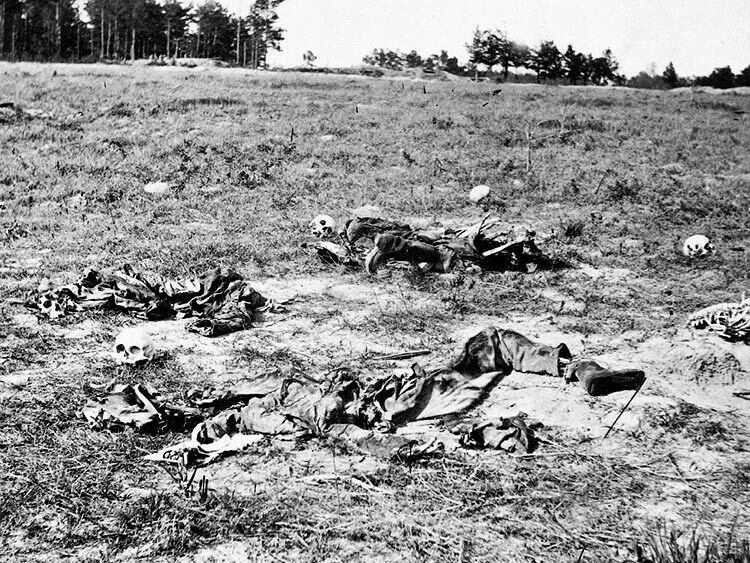 7000 Union soldiers fell in a quarter hour. 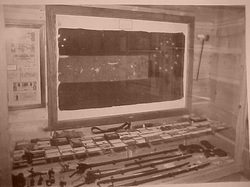 From left to right: The 2nd photo above on the right is from civil war archives and shows the gruesome results of that charge. 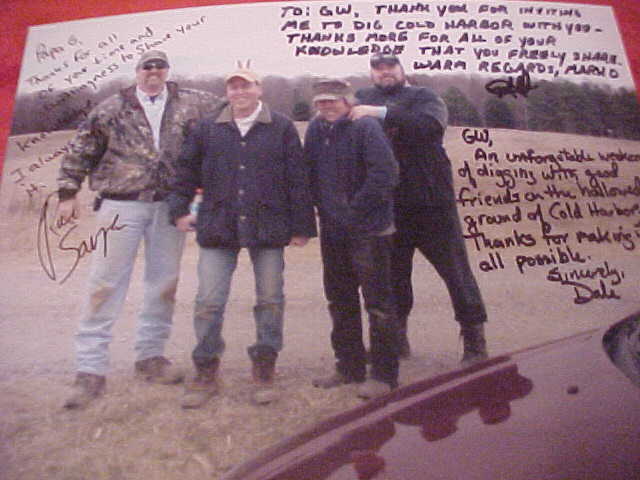 The 3rd photo to the right, taken 2008, is GW and John McAden, relic hunting on this site. 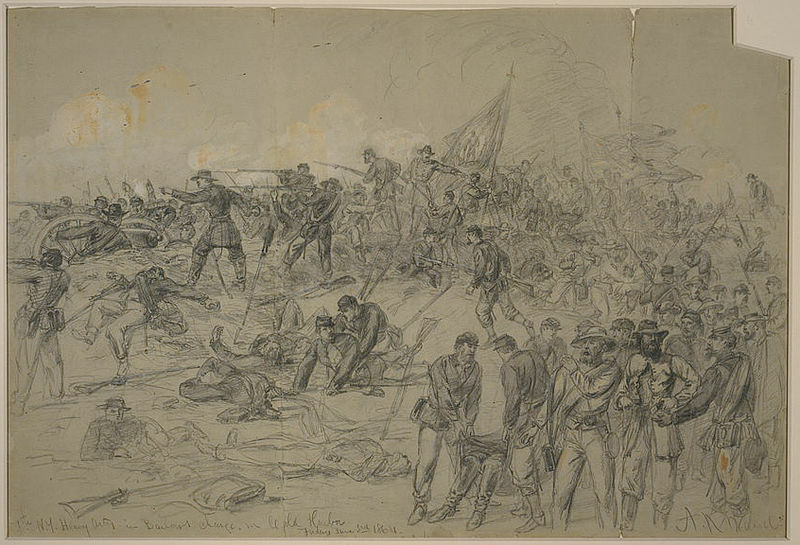 In the 4th photo is Charles Burnette digging in the Confederate trench line that the first photo (1864 Alfred P. Waud battle drawing) shows, which is Barlow and the 7th NewYork charging and capturing a cannon. 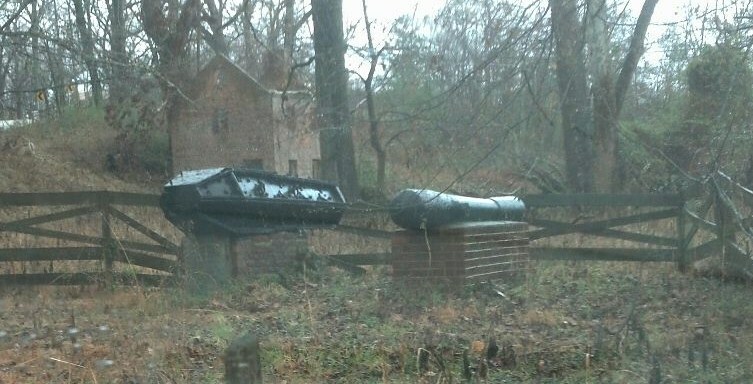 They did not keep this cannon very long. Part of these six- mile trench lines cross my residential property. I dug the remains of a soldiers wallet deep in the trench on the Adams Farm, Cold Harbor. The three pieces of paper displayed above is a one dollor Penn. note. On the right hard to see is nine dollors in coins. Two of these coins are 1861 one dollor gold pieces. 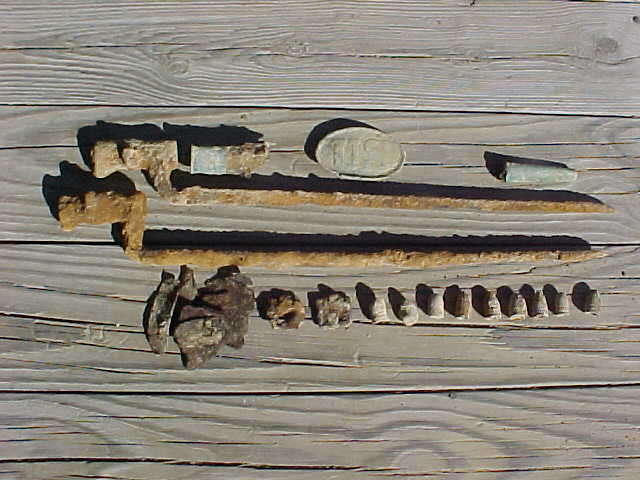 A union soldier lost these in the morning charge June 3rd. 1864. 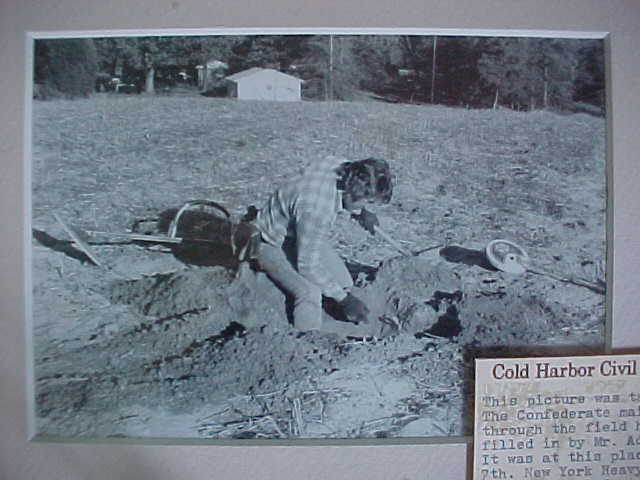 Cold Harbor Museum case number three. Also we find the remains of many rifles left on the battlefield. The dug bayonet in the back has a tin scabbard, not leather. 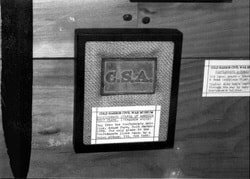 One of my favorite relics from this horseshoe trench is the C.S.A. 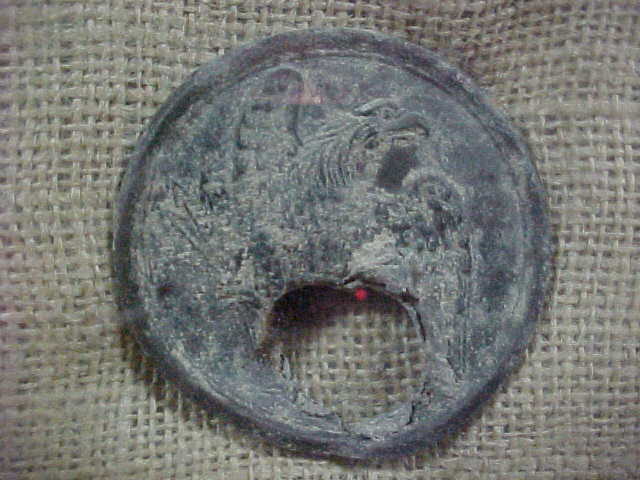 belt plate pictured above. 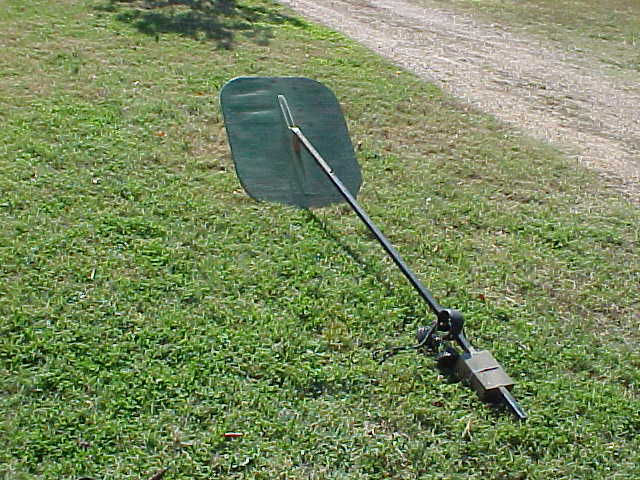 The belt plate had been hit hard above the "C". 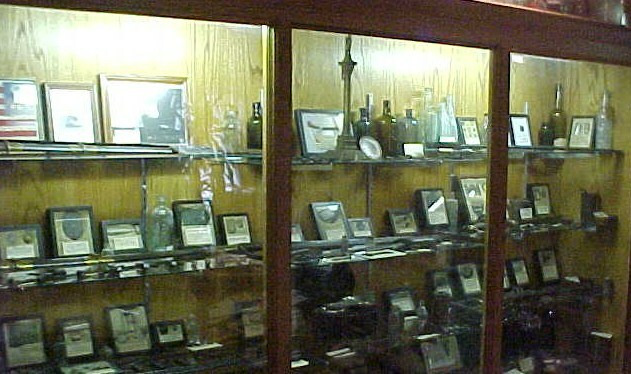 Display case in my Cold Harbor Museum. A rare Hales Rocket, artillery hat emblem, shells and other dug relics. 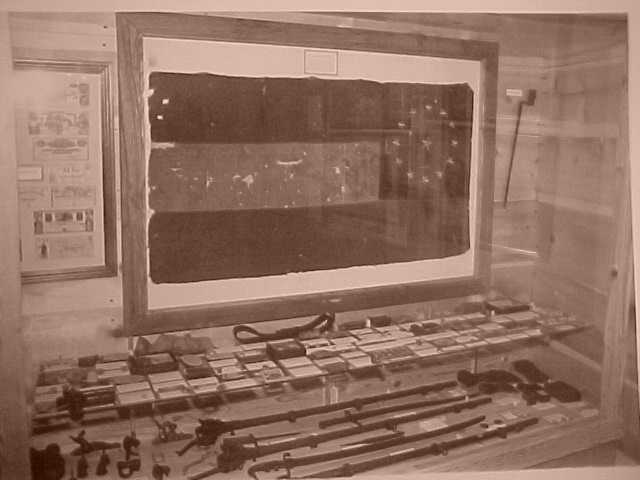 The leather purse toward the back has a shot minie in the side and a large cent inside stopped the minie from going into the soldier. 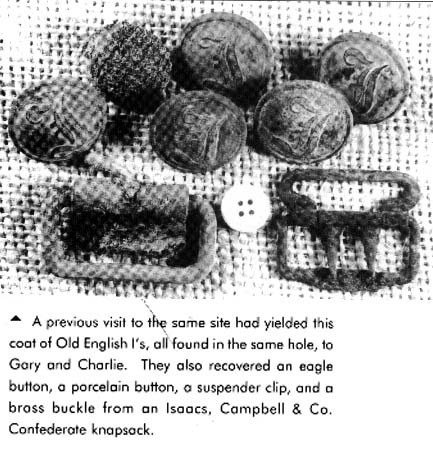 Confederate Infantry buttons from Cold Harbor. 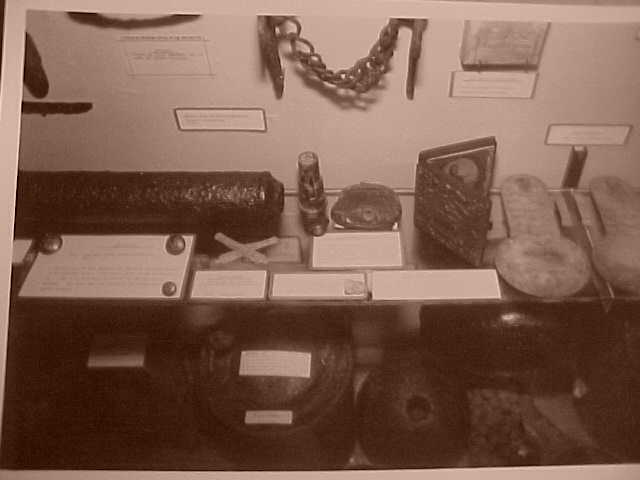 Battlefield and non-battlefield displayed with my Cold Harbor Museum War Between the States relics. 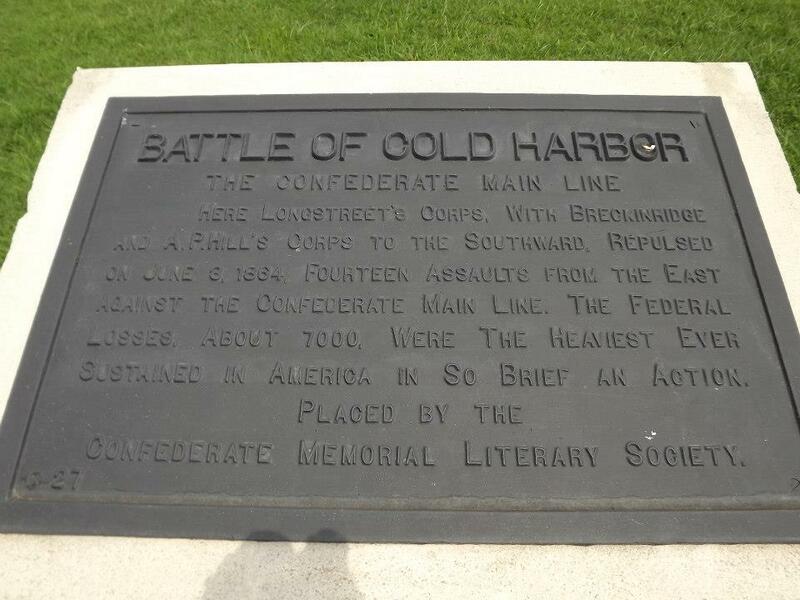 Battle (1st Cold Harbor). 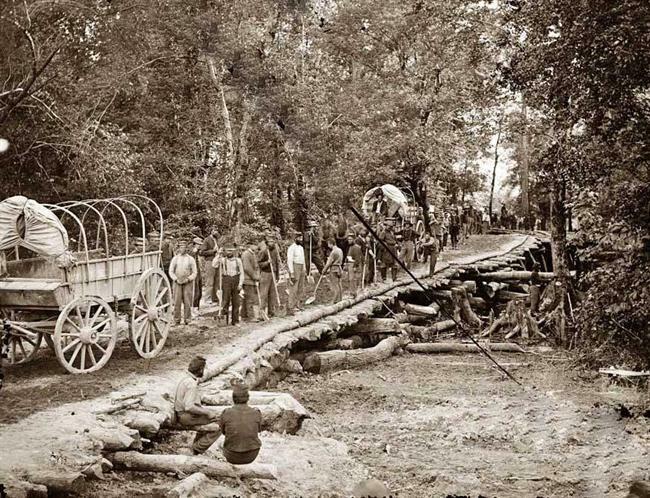 After the Union army crossed the bridge they burned it. 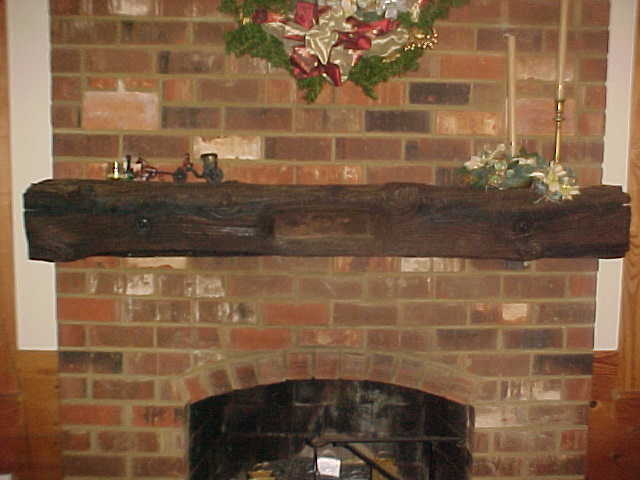 The center photo is a beam from this original Grapevine Bridge, now my mantle piece. You can still see the burn marks in the beam. Also, there are several minnie balls embedded in the wood. This crossing is in sight of my home. The photo on the right is how it looks today. On the bottom left you can see the original road. 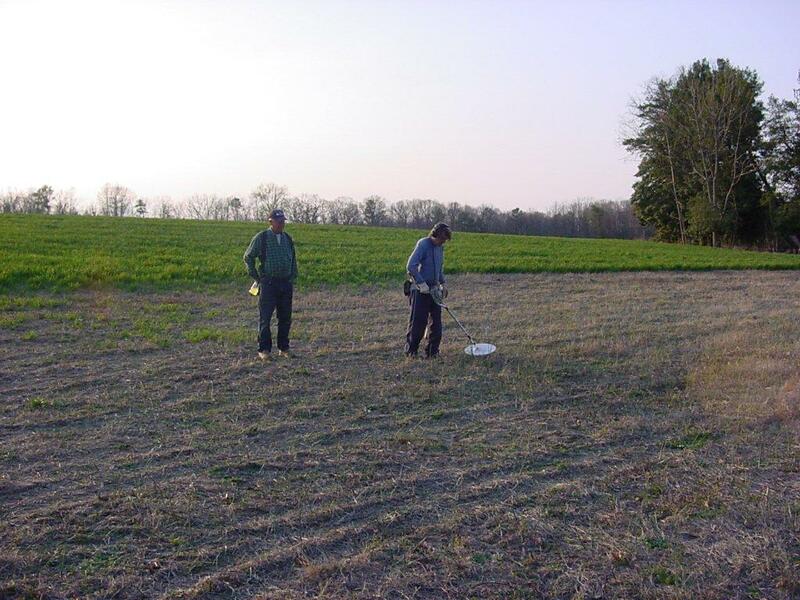 It was near this site in 1954 that I found my very first belt plate: an OVM (Ohio Vol. Militia). This sparked a life-long passion. Many of my reproduction buckles are cast from originals I (Gary Williams) dug from the Cold Harbor and other battlefields. Not a day went by that I was on some battlefield or campsite digging relics. 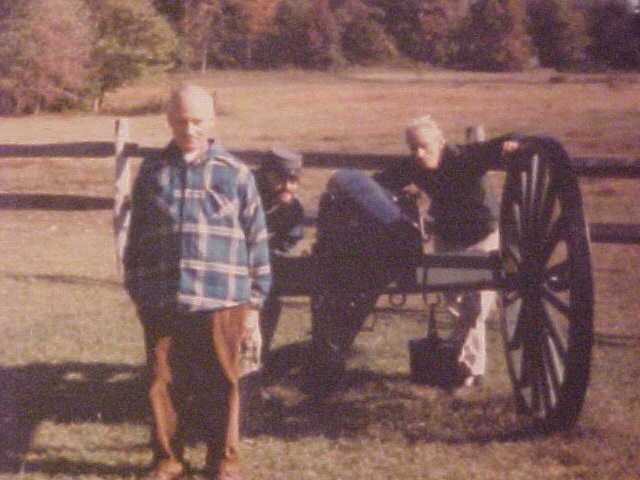 1955, just eleven years old with many battlefields and campsites to myself. The new relic hunters just don't know what it was like to be the first in one on these sites. 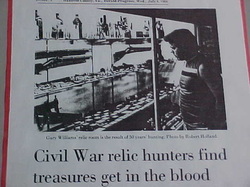 Hunted just about everyday and a waiting list of some of the well- known authors, historians and people who just wanted the adventure to dig a relic. DuBose, Dickey, Mullinax, O'Donnell, Gavin, Kerksis, Mason, authors, collectors and many others. I slacked off digging a little in 2000. Retired but reproduction business is good. My reproductions comes from someone who has walked the walk and truly loves the history. 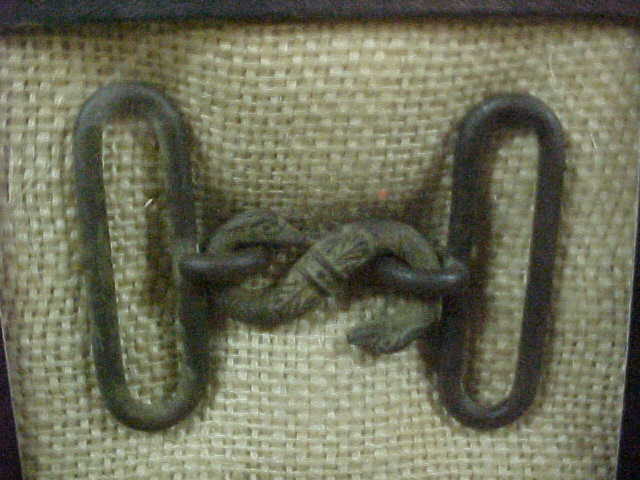 First reproduction buckle casting 1967. 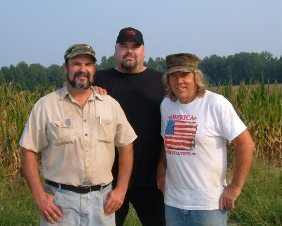 Henry Yelenik and the Lyle brothers at cannon in my front yard. 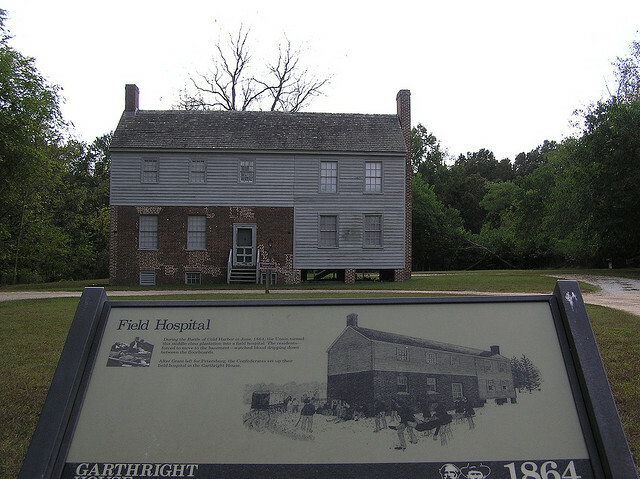 Henry was one of the first relic hunters in the Cold Harbor area. 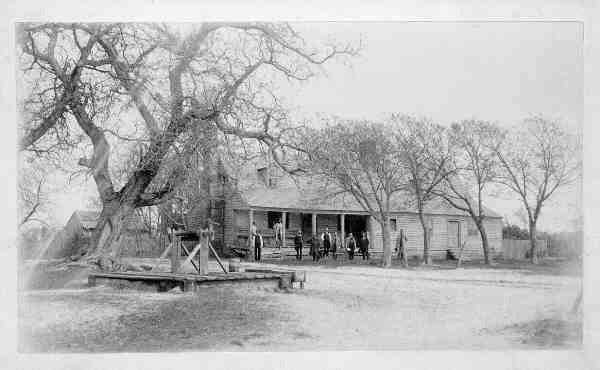 The Lyle farm was a prime hunting spot. 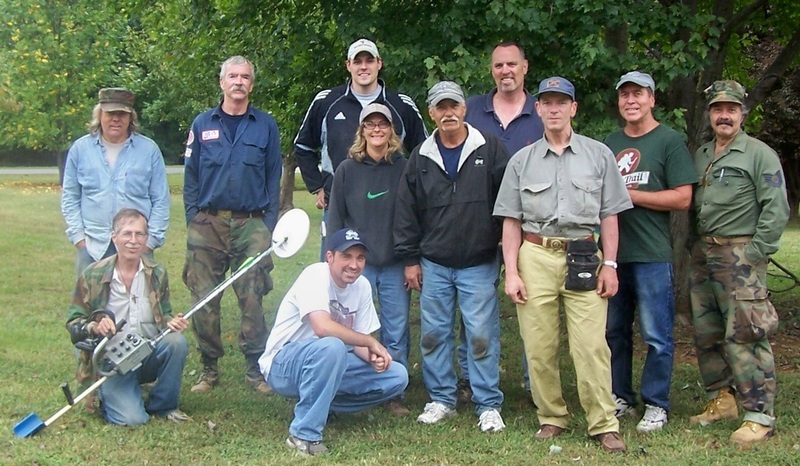 Relic hunting weekend with old timers and new guys. G.W., Kurt Owens, Mark Owens - Ga., Dale - N.J., Steve N/S Trader - VA, Pete George - VA, Kathy & Bill Hunt - S.C., Tom - VA, and Brian Tomer - Ohio. 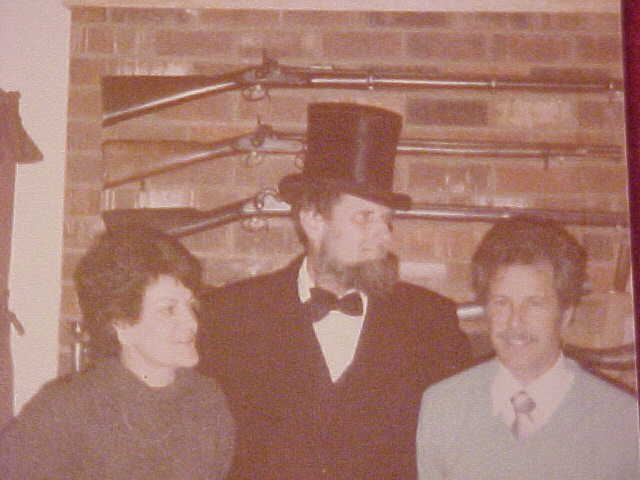 Joe Leisch "Abe Lincoln", actor, NSSA mortor competition champion. Joe Leisch getting ready to make an appearance at Teresa's school. Linda and Gerald, my sister-in-law and husband. 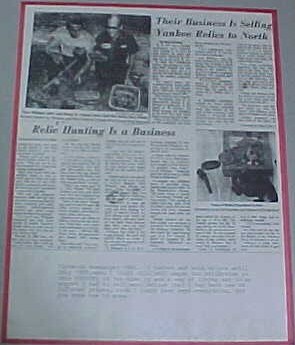 1968 newspaper article about Henry Yelinek and Gary Williams relic hunting Cold Harbor. 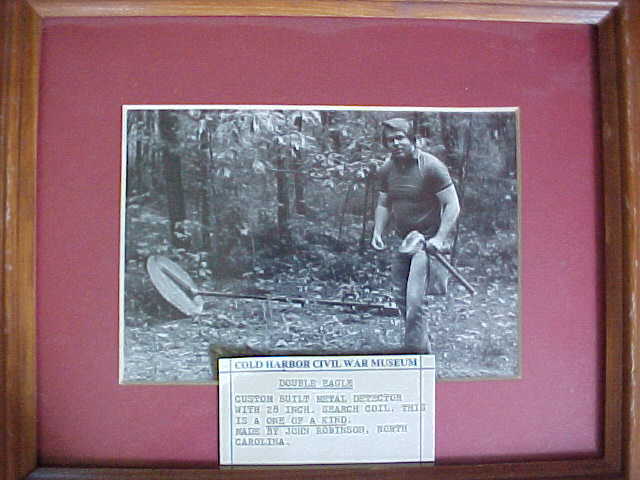 Mike O'Donnell, author, Ric Savage, wrestler and tv series highlighting relic hunting, and Gary Wiliams. 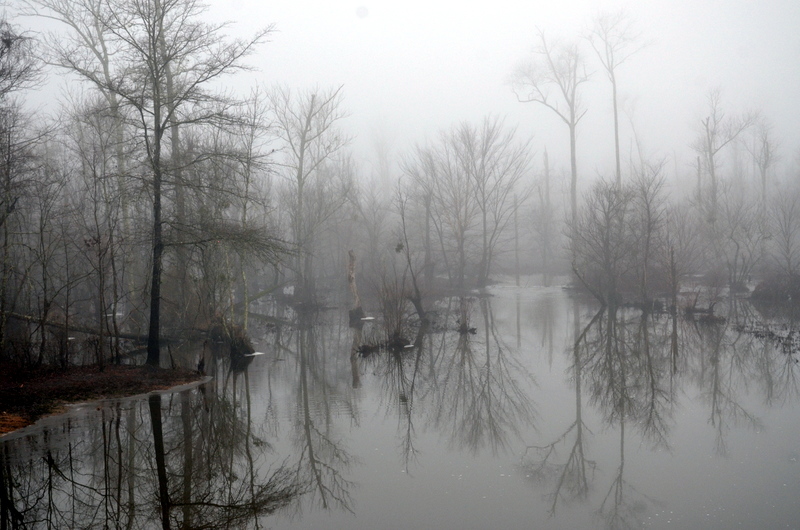 A day of hunting Cold Harbor area. 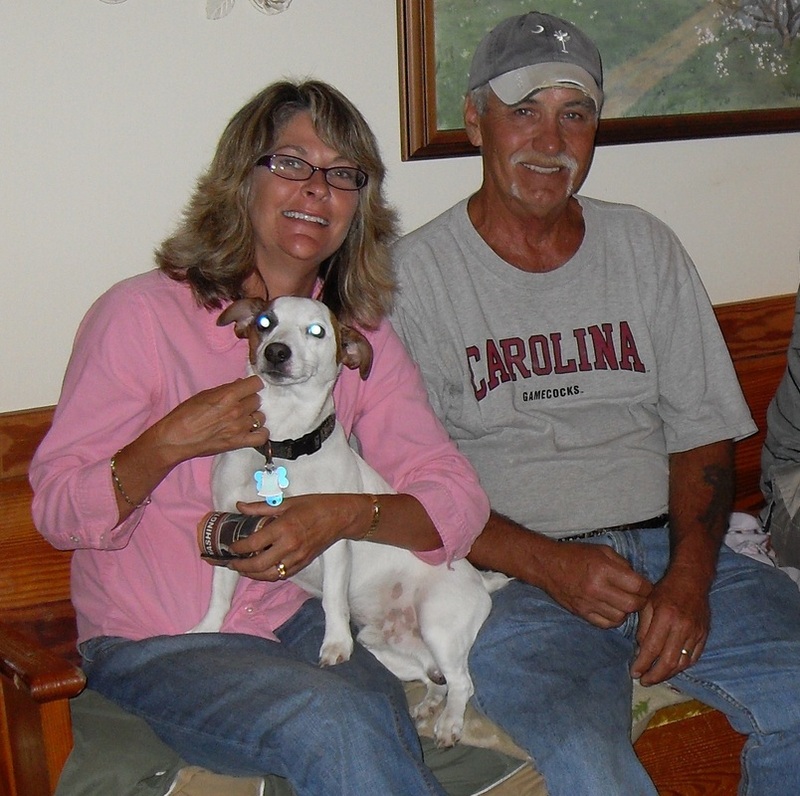 Bill and Kathy Hunt two South Carolina relic hunters. 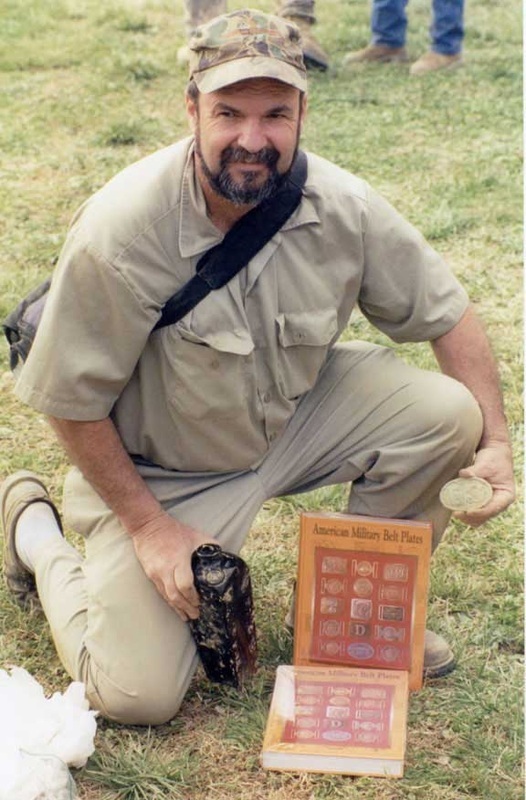 Bill has dug probably more slave tags than any other relic hunter. Mark Owen, Dale, Gary, and Savage. 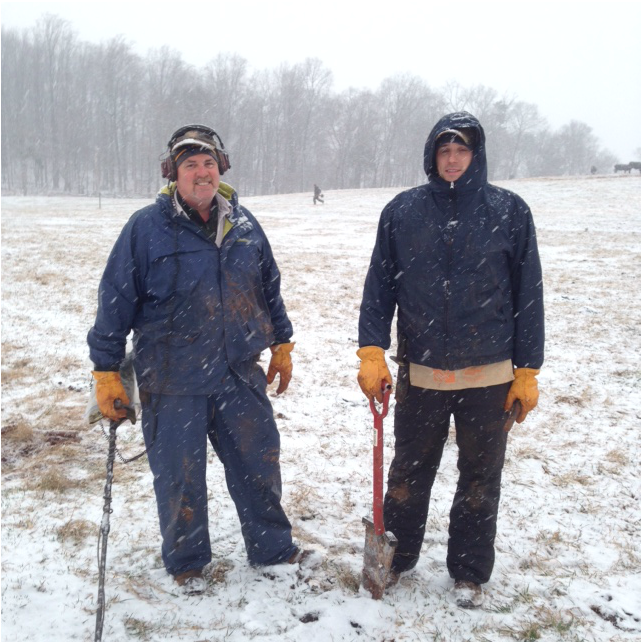 A week of hunting confederate trenches. 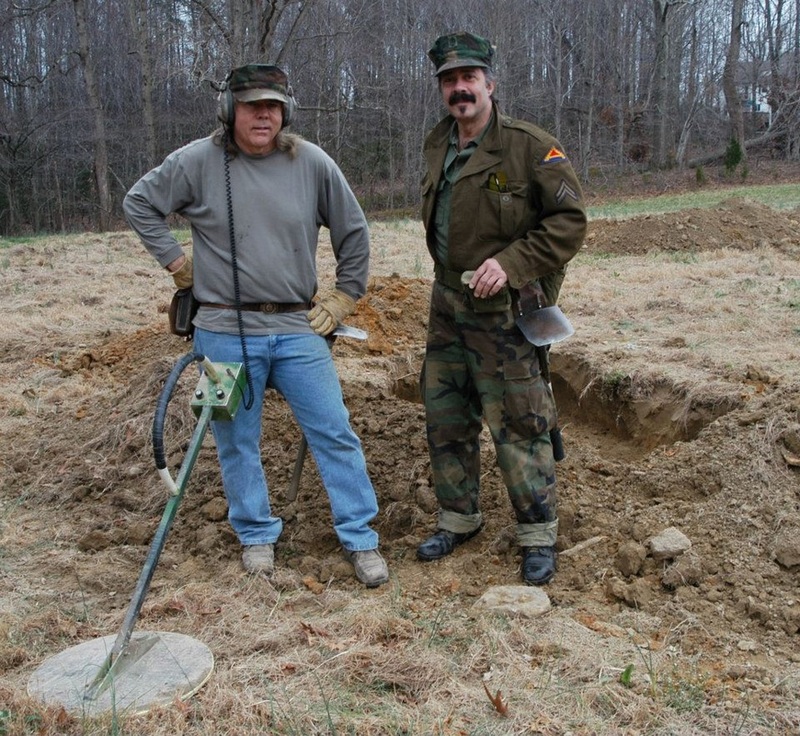 Two Georgia relic hunters at the March 2014 "Digging in Virginia". Mark Owen and his son Kurt making the best of the snow and cold. feet seven tall I made Kurt my body guard. 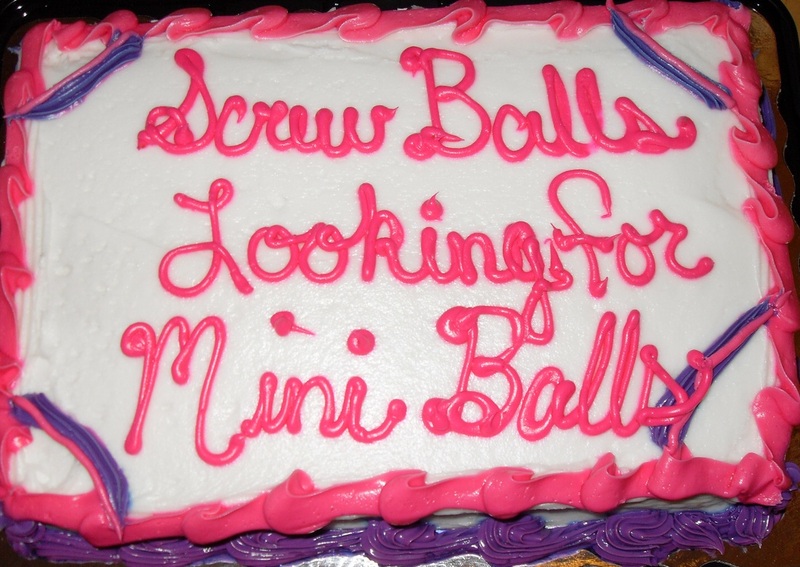 This cake says what some people think when they see relic hunters. to see another day. Shot items are very rare. 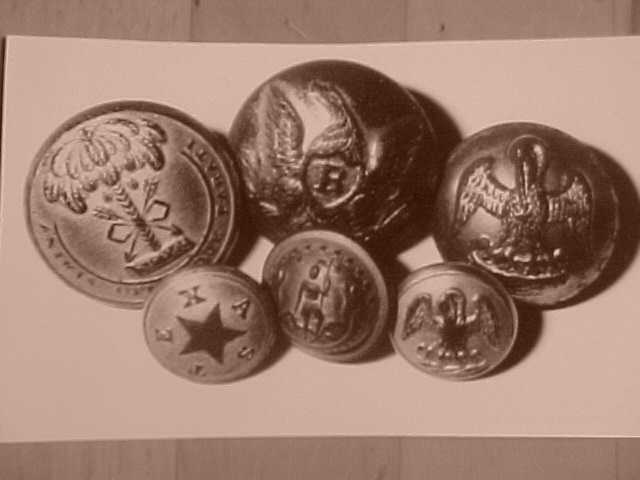 Buttons dug from the sandy soil of Cold Harbor, notice the condition, some with remaining gold plate and little corrosion. 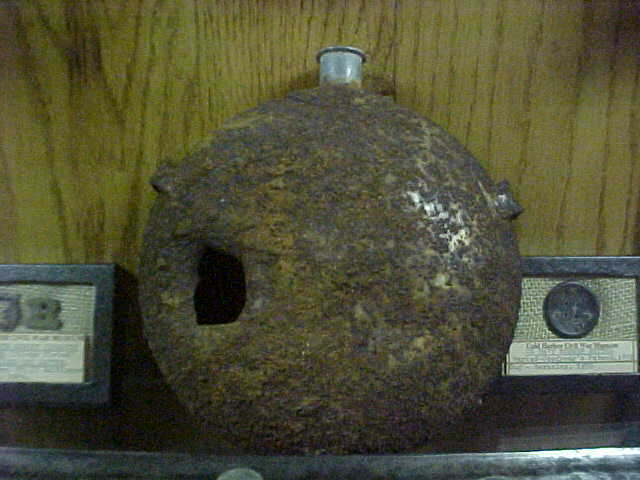 Shot canteen dug by Teresa Williams from a union trench, Cold Harbor. Mike O'Donnell is the author of many civil war books. If you need someone to research and publish your book see Mike. Mike is also one of the old time relic hunters. 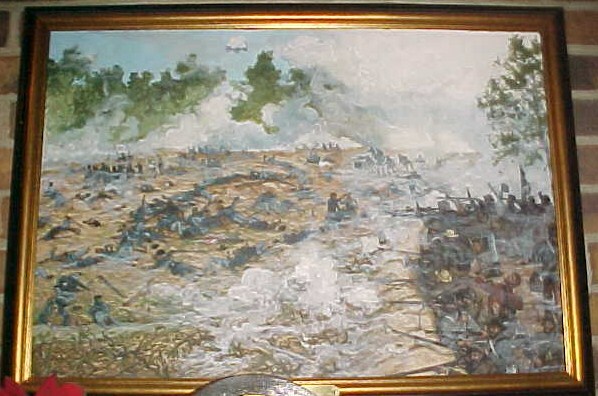 A Major in the Marine Corps painted this one of a kind painting for my Cold Harbor Museum of the battle of Cold Harbor June 3rd, 1864 depicting the morning that they made the bloody charge where 7000 Union soldiers fell in twenty minutes. It was likely real close to what it would have looked like that morning. 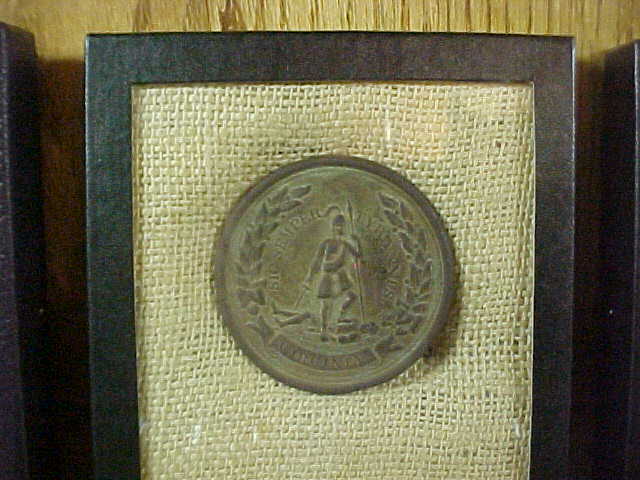 Louisiana coat button stamped in solid silver, this rare oneof-a-kind find dug from the Outer Defense lines by Teresa Williams. I have never seen another silver LA coat button. 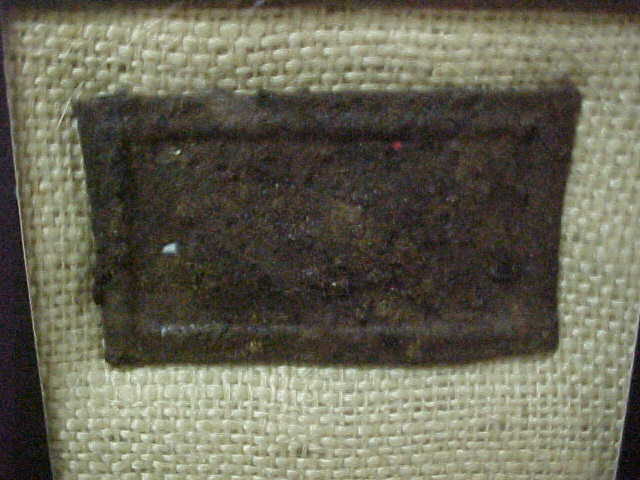 Iron buckle, not much to look at but very rare, this one dug from Malvern Hill. Ronnie Mantlo with two US buckles he just dug. 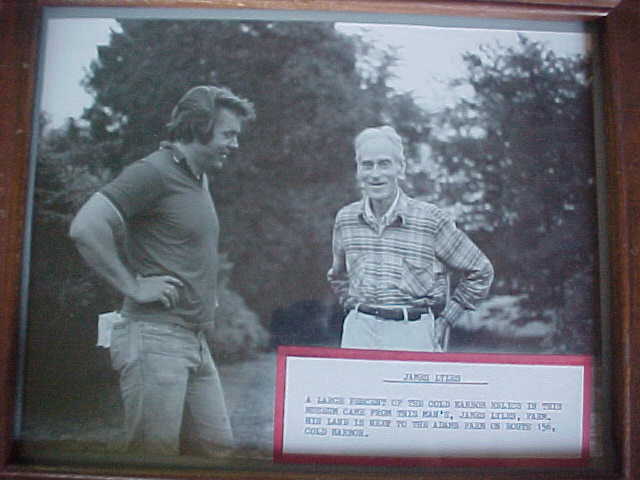 He dug his first relic in 1960. 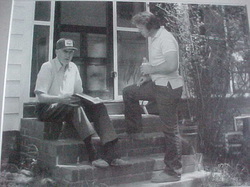 Joe Leisch, Berryville,VA. 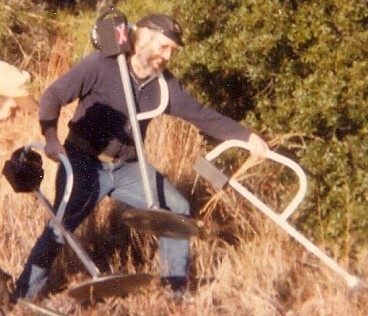 Joe in his 80's and still relic hunting. 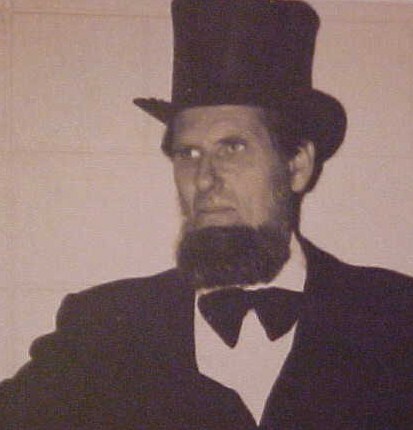 Late 1960's he was Lincoln on a TV special. 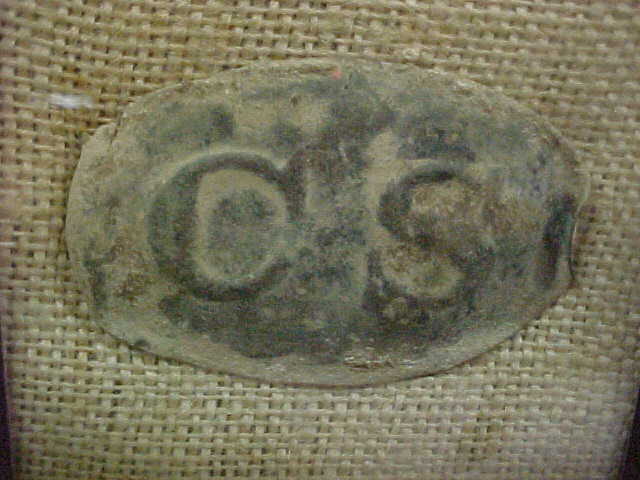 CS Oval waist belt plate that I dug from the White Oak Swamp Seven Days Battle.The Army of Northern Virginia CS Oval plates were lead filled, as compared to the Army of Tennessee plates which were just stamped, no lead fill. NY Script belt plate, I dug from the Cold Harbor battlefield. 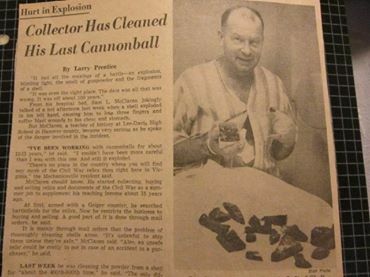 My History teacher Sam McClaren lost a couple fingers trying to unload a Civil War artillery shell 1960's. Not only into the history but one of the first dealers and you would not believe the cheap price back then. Use to sell and trade him relics in high school days. A Marine who fought in World War 2. 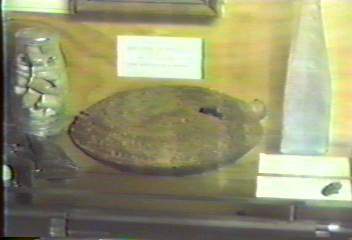 Confederate Snake Plate that I dug in Cold Harbor, along with another in the same hole. 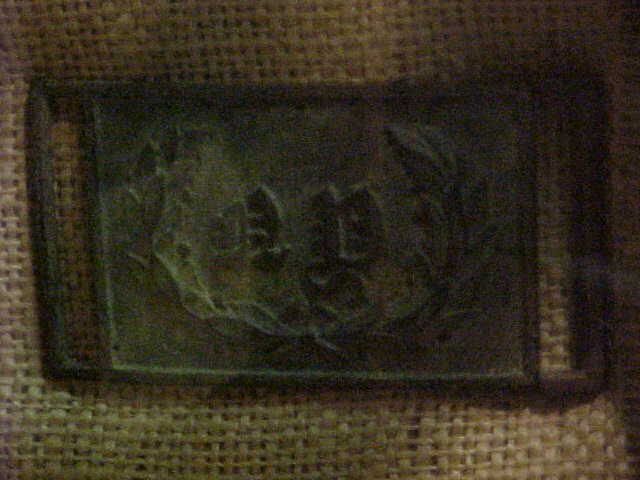 The is a blockade buckle often pictured with Massachusetts soldiers and enfield rifles. Virginia Breast Plate, I dug Fredericksburg, VA. These were stamped brass, no lead fill, with a brass pin for attachment. 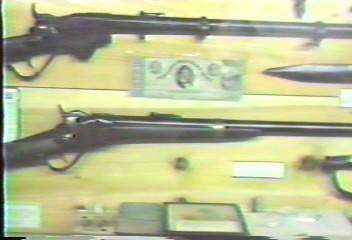 Dug Spencer Rifle and a non-dug Sharps Carbine. 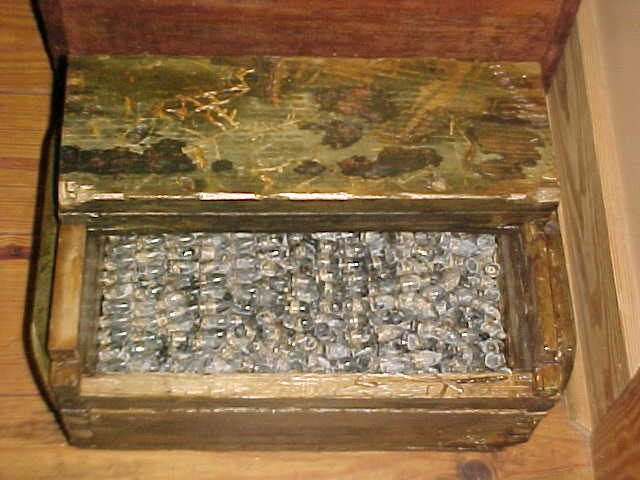 Ammo box with 1000 minie balls that I dug from a wet area on the Cold Harbor, VA battlefield. 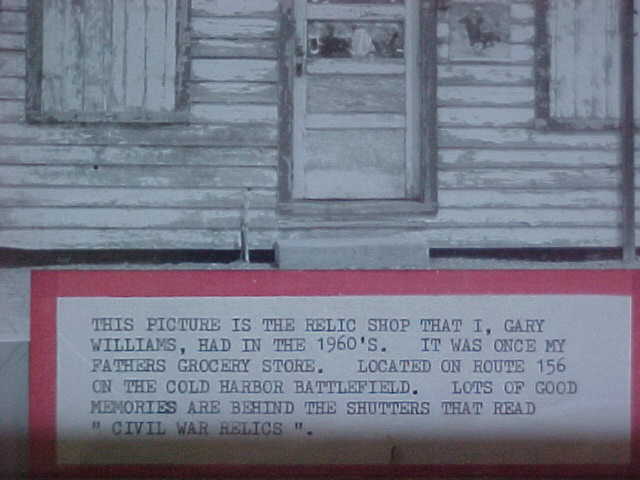 Historic site marker explains why so many relics are retrieved from this area. 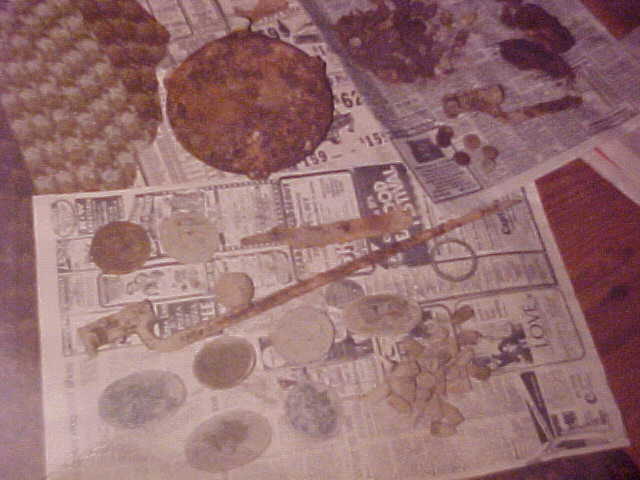 All the relics that I dug are from private property with the land owner's permission. 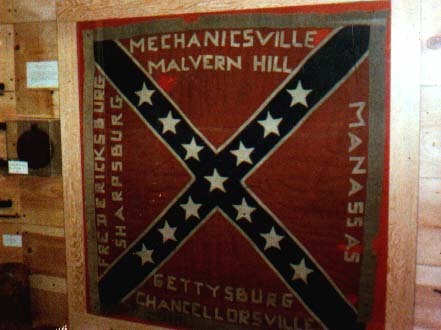 Gen. Bedford Forrest Morton's Artillery Battle Flag, liguidated from Chicago historical Society and the first battle flag I purchased. 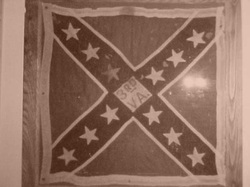 Georgia Infantry Battle Flag with seven battle honors. 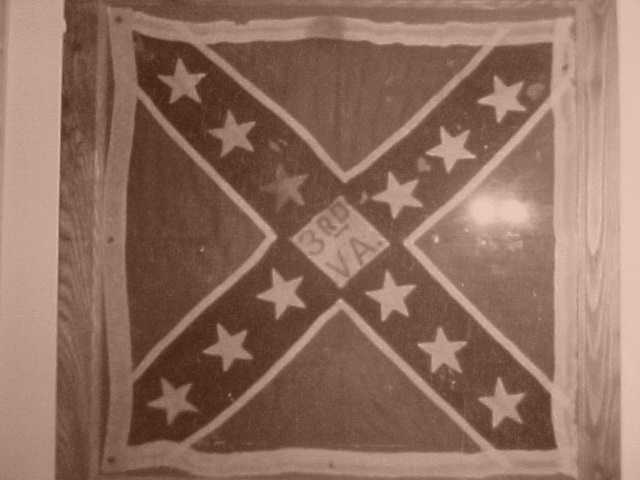 3rd VA Cavalry Battle Flag, carried by a cavalry troop from New Kent County, VA which is a neighboring county to my home county of Hanover. 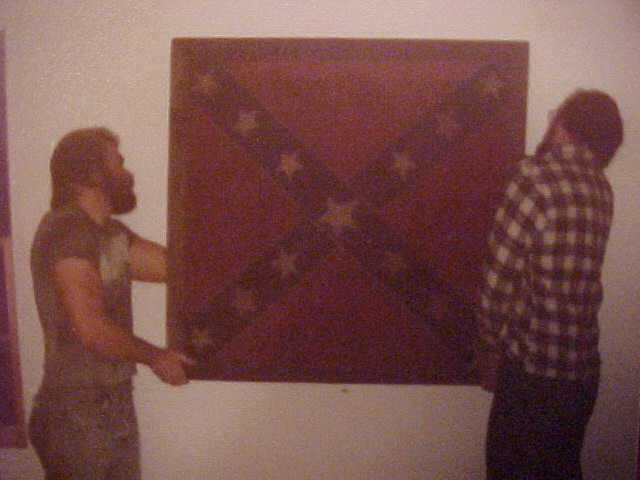 1st National Battle Flag, once belonging to Confederate officer Raphael Moses, Georgia regiment and purchased directly from the family by Beverly DuBose. I purchased the flag when it was liquidated from the DuBose collection.